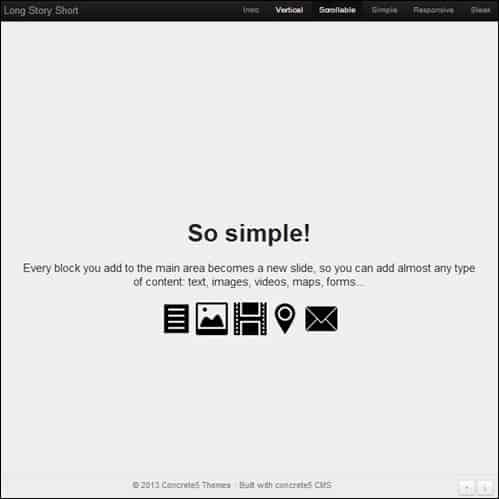 In this post, we will be showing you a collection of 25 free Concrete5 themes. 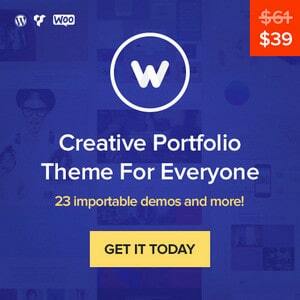 The themes are highly rated, and they are ready to be downloaded. 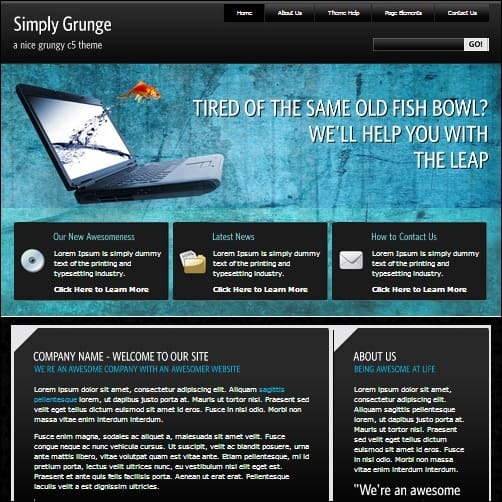 Concrete5 is a popular open source Content Management System (CMS) with thousands of websites created on the platform. The system is easy to manage, and you should be able to build a website even if you are not a trained web designer. The simplicity and ease of use makes Concrete5 perfect for people with minimal coding skills, and there are more goodies under the hood. 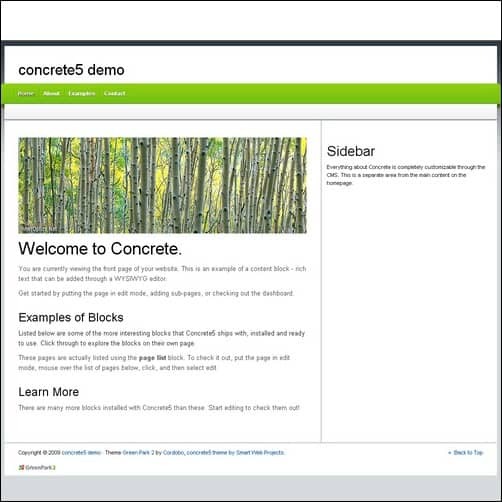 Like other popular content management systems such as WordPress, Concrete5 has an official repository with plugins and themes. It serves as a useful resource for users in need of free and premium add-on’s. 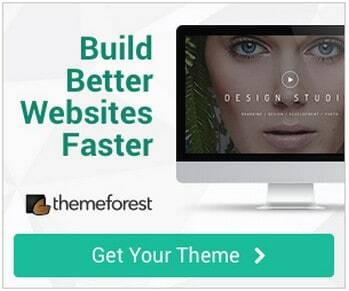 However, searching for feature rich and high quality C5 themes can be quite time consuming. If you like Concrete5, make sure to check out the fully-licensed premium themes found over at Envato Market. 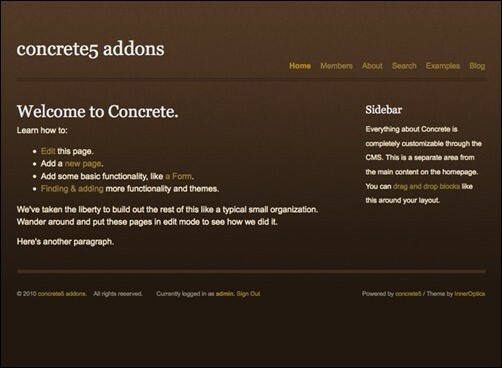 To get you started, we took the matter in our own hands and compiled this list of high quality free Concrete5 themes. Some of the features you should look for is a set of powerful theme customization options, HTML5/CSS3, cross browser compatibility and responsive design. 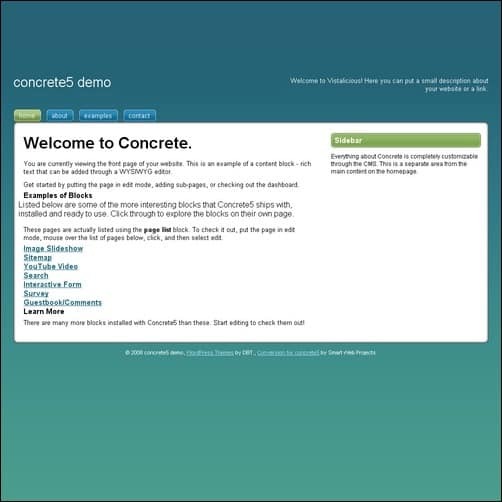 We hope that this collection will serve its purpose and if you have any thoughts about free Concrete5 themes, kindly inform us through the comments. 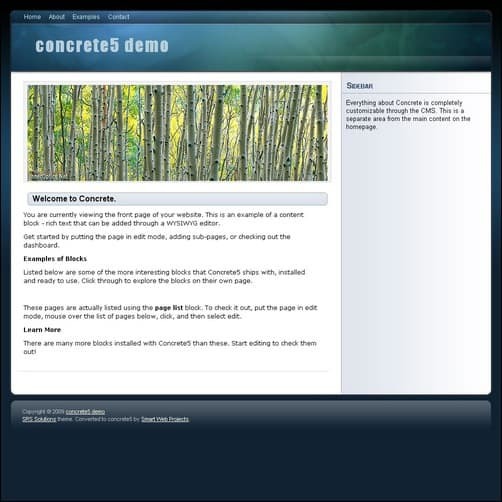 You may also share this post with friends if you think they might be benefited by this post on free Concrete5 themes. 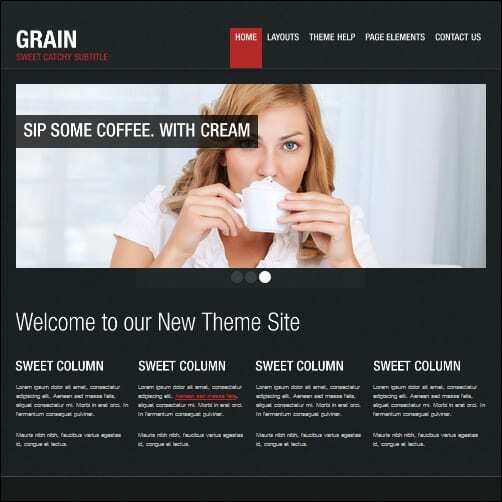 Grain has some features that you may find useful such as Simple Logo, Simple Address vCard and Power Slider. This theme has nice design and professional look. Its key features are useful for enhancing the UI design of your website. 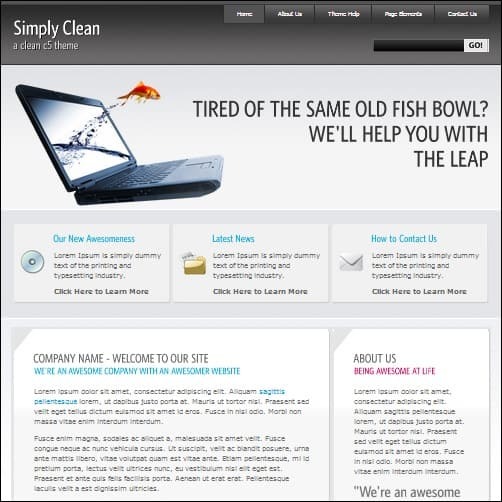 These include single or 2 column layout, responsive design, powerful jQuery image slider and custom typography logo. 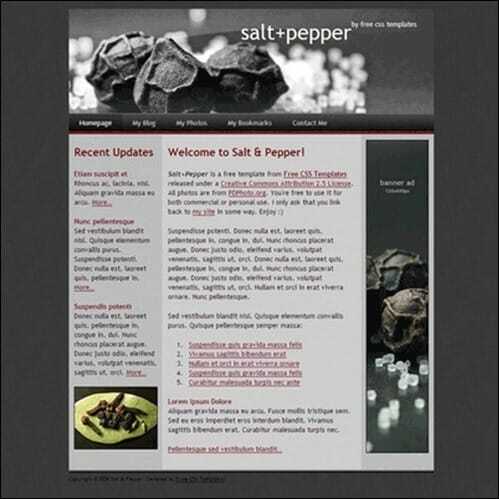 This is a CSS open source template that uses XHTML 1.0. It features a custom template for both login and search blocks. 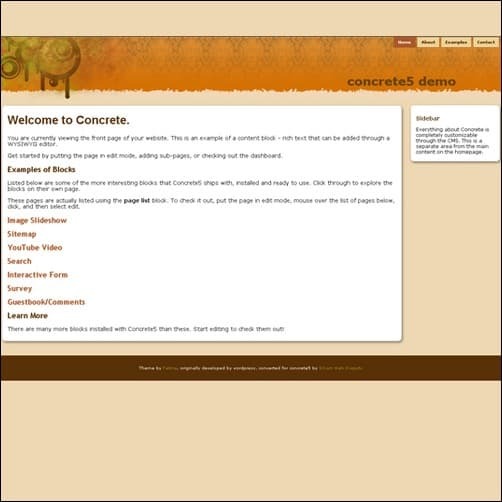 This is a responsive and SEO customizable theme for concrete5 that has good customization options. This is a minimalistic, black and white C5 theme with 3 columns. 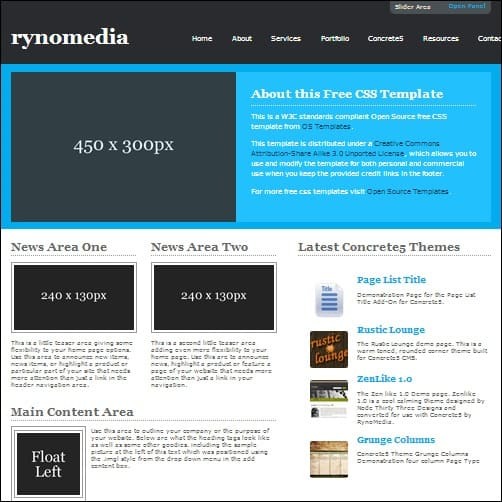 This Concrete5 theme has a black web 2.0 style frame. It includes a three column layout. It also includes a nicely styled navigation for the sidebar. 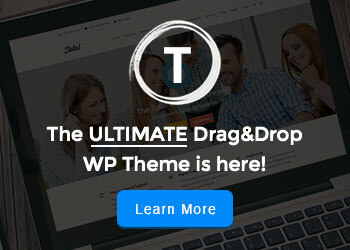 The features of this theme includes page type for ChadStrats ProBlog, responsive layout, HTML5 validating markup, dropdown styled navigation, print style sheet and 3 blocks. 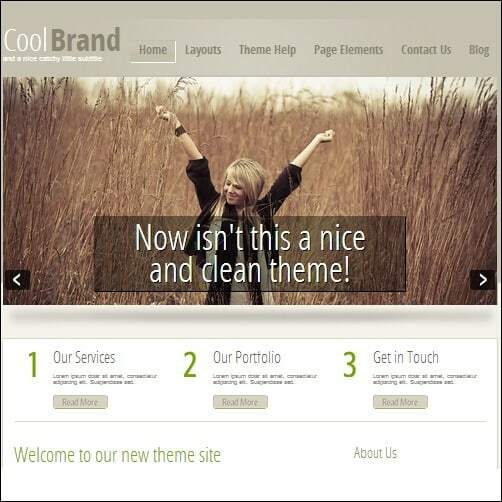 This is a basic and simple theme that you can use for setting up a single page scrolling website and presentation. Each block that is added to the page will be transformed into a new slide automatically. This free Concrete5 theme has an attractive design. The thumbnail can be clicked to view it as a larger image. 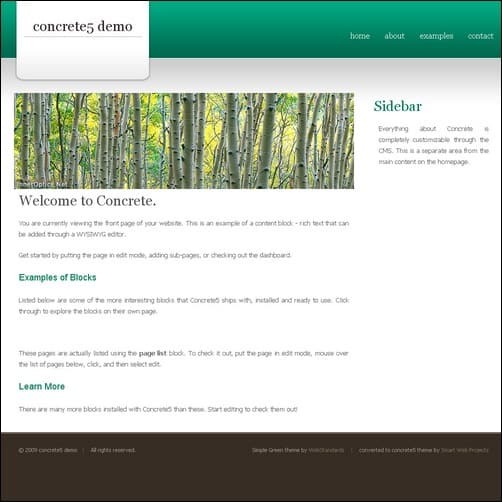 This is a modern Concrete5 theme that was converted from WordPress. It has a rich gradient that will make your website serious enough for business. It is also search engine friendly. This is a skin for people who are looking for a nice and unique Concrete5 theme. Its two column design lets you add content on the left and sidebar on the right. Colors include brown, yellow and orange. The features of this theme includes page type for ChadStrats ProBlog, responsive layout, HTML5 validating markup, dropdown styled navigation, print style sheet, mobile style and 3 blocks. there is nothing excessive on this theme – everything is simple and clean. Originally released for WordPress, Vistalicious was converted into a C5 theme and is starting to gain followers. 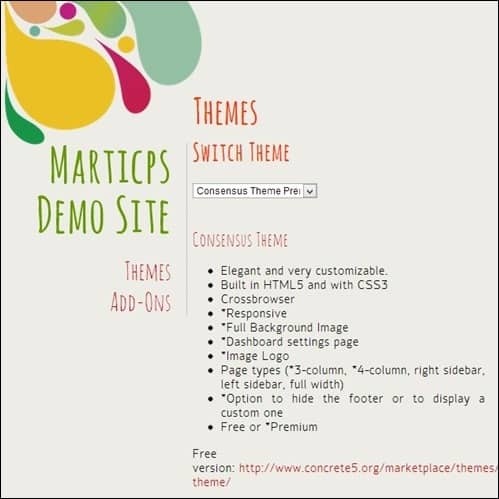 Designed by Marticps, this liquid Concrete5 theme can be customized to suit your needs. 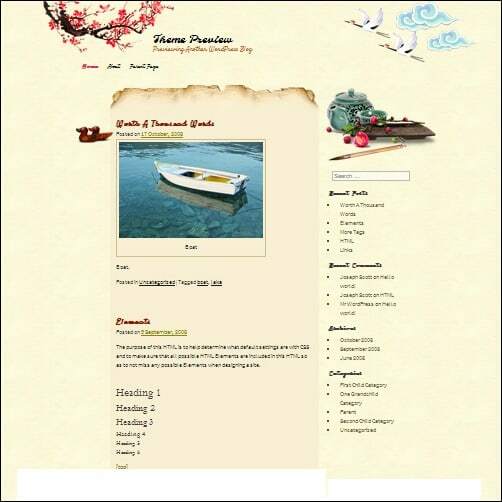 It is cross browser capable and coded in HTML5/CSS3. This is a minimalistic theme designed in tan / brown. If you will describe this theme, the most appropriate would be clean and clear. The design is quite simple yet very attractive. You can also read the text easily. This is a simple yet professional looking Concrete5 theme in grayscale layout. 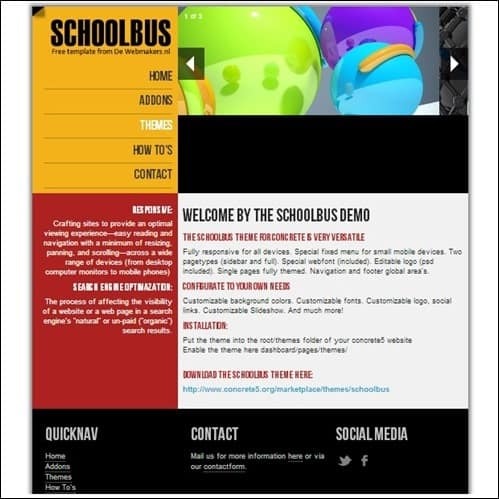 This responsive theme has styled drop down navigation and print style sheet. There are 3 blocks that are included in the package and yes, it is also pretty. This theme has a lovely 2 column skin that was initially designed for WordPress. 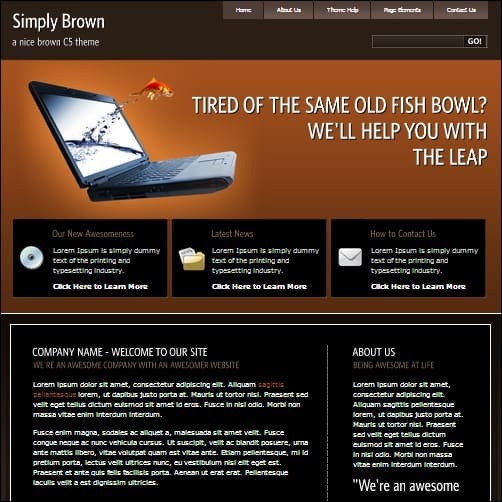 its general layout and navigation are some of the more likeable attributes of the theme. This is a tabbed free theme. It is quite simple and have few customization options. 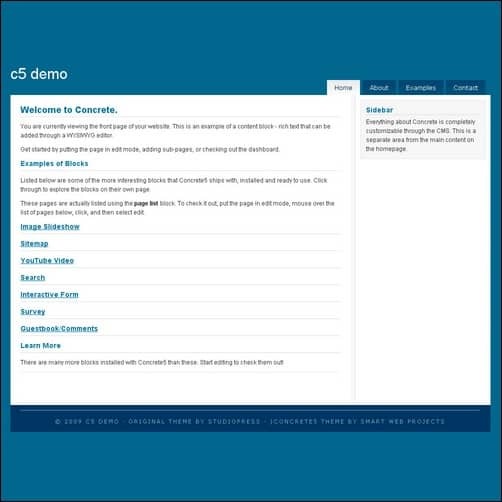 Demo image is from a website that uses the theme. 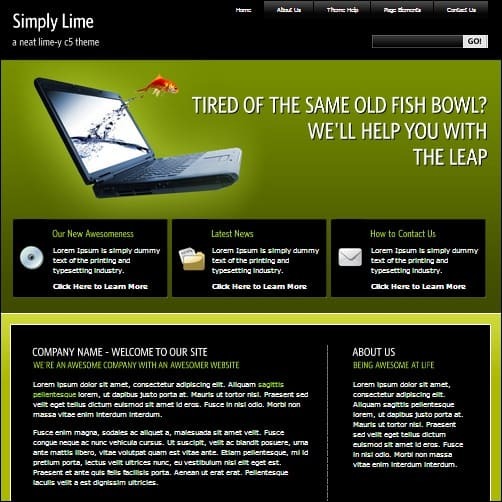 This is a C5 theme that is bright, nice and incorporated with an animation movie style. This is a very basic theme. It has very limited use so it’s not designed for just any old site. 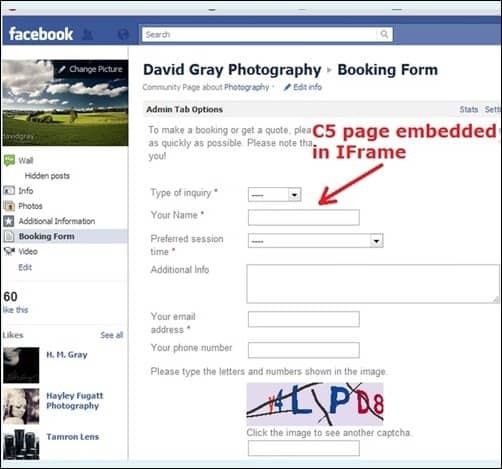 See the documentation page for a Facebook app you can use with this theme. 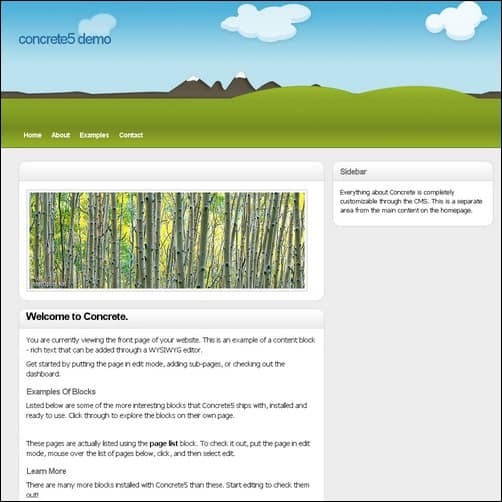 This is a WordPress theme that was converted into Concrete5. It is a popular option among WordPress users so it might give some success as well. 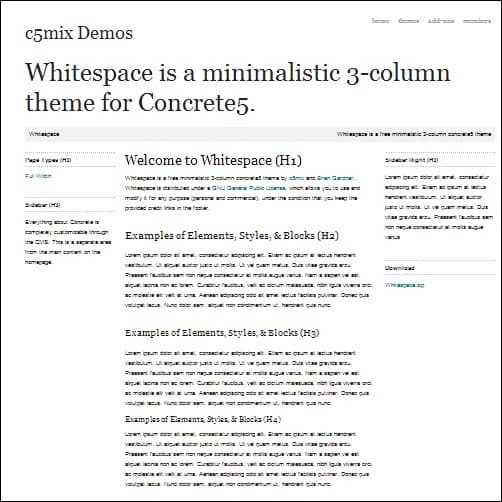 This light 3 column Concrete5 theme can be downloaded for free. The text can be read easily so if you have more texts in your website, you can use it to lure in more visitors. 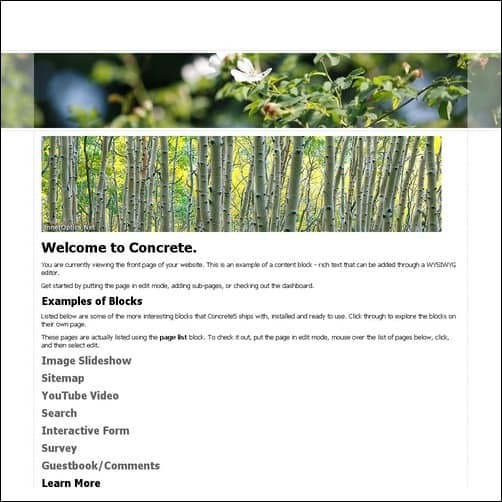 These Concrete5 templates look superb. Thanks Anders for sharing them.